When we were moving into our current home in the Fall of 2004, I found a photo of a living room that I loved in a magazine so I ripped it out and placed it into my decorating notebook. 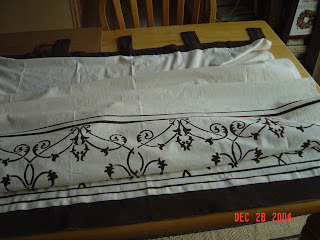 It was a picture of floor length curtains with a beautiful design on the lower portion hanging in a window with wooden blinds and a wood floor. When we moved into our new home I didn't get the wooden floor, as the family room had brand new cream colored carpet, but I was determined to track down the curtains for our beautiful large picture window. At around $1,000 for the curtains I loved, I once again decided I had Pottery Barn style tastes on a Walmart budget. I then kicked in plan B and decided to make my own as frugally as I could. Ok, so I had no plan B, but I came up with one on the spur of the moment and this is what I got. I found plain cream colored tab top curtains at Lowe's for about $14.99 each. I then saw they sold plastic stencils for wall decorating. But, why couldn't I use it for fabric? Another $15 investment and I was out the door. At home I had leftover wall paint from a chocolate colored wall I painted in that same room. using the leftover paint saved me money, but also ensured the color of the curtains would match perfectly with the wall. 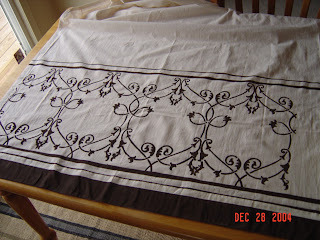 I laid out the material on my work table and placed the stencil where I wanted the finished design to be. 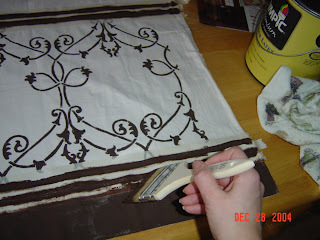 I also used masking tape to tape off 'lines' or stripes where I wanted to add accents across the curtain. Then, using a simple, cheap bristled brush I painted on the color. I painted the tabs at the top of the curtains to bring the whole look together. I loved the finish product! Very similar to the $1,000 version, my cost was right around $50-60.